Life Begins at 40 for Who fans? It's now available on pre-order from publishers Hirst (who also published Blue Box Boy, several books by Colin Baker and Anneke Wills' autobiography). Jeff is a barman, constantly forestalling marriage to his neurotic new-age girlfriend, preferring the company of Pete, an agoraphobic misfit with some serious baggage. United by their social detachment and love of Doctor Who, their world view is tainted by too much cult TV, and the walls between reality and fantasy begin to blur, with hilariously disastrous consequences. With middle-age fast approaching, can they really spend the rest of their lives hiding behind the sofa? Life Begins at 40 deals with the big questions. Should we get married? Are children a good idea? And, in the future, will we all be walking around with one eye and no arms from too much teleporting? With a foreword by Doctor Who star Sophie Aldred, Life Begins at 40 is hilarious and essential reading for Doctor Who fans, anyone who sees middle age looming, or anyone who loves a good laugh. The book is available for pre-order, and if you buy it now you'll be lucky enough to get a signed and dedicated copy with your name in the credits before the book hits the shelves! 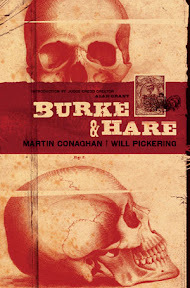 The Burke & Hare graphic novel website is now live at www.burkeandharecomic.co.uk ahead of the new movie release, featuring a preview, some info about the book and links to purchase a copy. While writer Martin Conaghan tells us the new Ealing Studios movie directed by John Landis isn't based on the graphic novel, interest in the film has certainly spurred people to check out their limited first edition of the book, which is still available to buy now priced just £10 (plus £2 P+P). £12 delivered! The film stars Simon Pegg (Star Trek), Andy Serkis (Lord of the Rings) and Isla Fisher. The story of William Burke and William Hare, who disposed of 17 bodies to the Edinburgh medical establishment - 16 of them murdered - in 1827 is the stuff of modern legend. It's also mired in falsehood, misconception and myth. Almost universally, the duo are hailed as 'graverobbers' or 'bodysnatchers', often depicted as stealing freshly-interred corpses to sell to the eager doctors at the Edinburgh medical school - when, as far as history is concerned, neither set foot in a graveyard with the intention of stealing a corpse. The organisers of the popular Dublin City Comic Con have announced the event is to "downsize" for 2010, with a smaller festival replacing the planned larger event which has been hit by venue problems. However, the organisers say they'll be back with the main event in March 2011. "We've had a hiccup in the ever wandering story of the DCCC," the organisers have announced on the event's facebook page. "We had a venue booked for a few months and all was sailing straight when we found out that the venue has been sold. That left us in a bad position to find a new venue in time: we thought we did but then all went wrong in a hundred different ways." 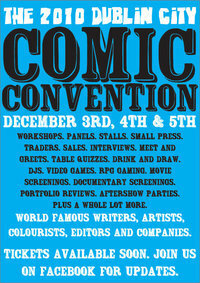 As a result of these logistic problems, Dublin City Comic Con will not be happening in its traditional form this year. "The plan is to move the entire event to March in 2011," say the organisers. "What we are going to do is run a small festival on December 3rd and 4th in Dublin. This was the plan for next year anyway. We were to start doing two events per year - a traditional convention and a small social comic festival. "We will have two or three comic pros over [in December], a small comics market, signings and some workshops, over two different pubs and bars per night." This is the second convention popular with British fans to be hit by problems in recent months. The organisers of Hi-Ex recently announced their planned 2011 convention in Inverness would not take place at all, to the dismay of regular attendees. 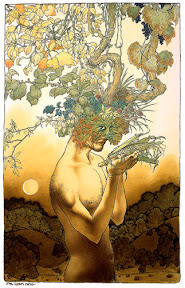 Continuing radio show Panel Borders month of shows looking at horror and dark fantasy comics, in a pair of interviews recorded at this year’s British International Comics Show in Birmingham, Alex Fitch talks to artists Charles Vess and Peter Gross about their work. Charles is the World Fantasy Award winning illustrator of Neil Gaiman’s Stardust (adapted into a film in 2007), two memorable issues of Sandman featuring William Shakespeare and an unusual graphic novel that saw Marvel Comics’ most famous character visit Scotland in Spider-Man: Spirits of the Earth. Peter was the main artist (and later writer) of the much loved American fantasy series The Books of Magic which was probably was an influence on Harry Potter and more recently has worked on Vertigo titles Lucifer and The Unwritten with Mike Carey. 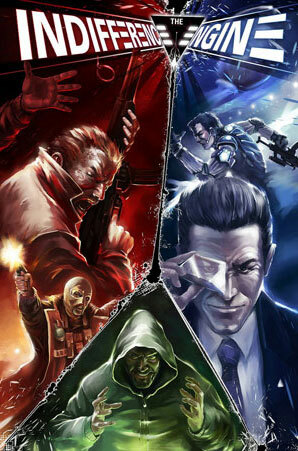 Cy Dethan and Robert Carey's new project, The Indifference Engine, is set to be released soon by publishers Markosia. The team on the book have kindly sent us a review copy of this tightly-written multi-universe-spanning adventure tale -- and it's definitely a book to look out for if you're a fan of alternate timelines and other such SF themes. Responding to a strangely specific job advertisement, Alan Blake, a distinctly ordinary 20-something suburban slacker finds himself in the middle of an inter-dimensional task force staffed entirely by superhuman alternate versions of himself. Struggling to fit in, he uncovers a conspiracy that strikes at the very heart of the organisation – a conspiracy that only he can stop. Alan, by any credible standard, is a waste of good skin - a directionless and ambitionless slacker whose single most notable characteristic is that he makes other people feel good about themselves in comparison to him. Alan considers himself a good listener, but it’s more complex than that. It’s almost like he absorbs other people’s problems and somehow unburdens them. If he weren’t such a loser, that one character trait alone could have made him immensely popular. Still, at least he serves a purpose of sorts. Whatever your own personal flaws or failings, hey – it could be worse. You could be Alan Blake. Cy Dethan's script is superb on this book, with Robert Carey bringing what the team describe as "just the right combination of subtlety and power that the book needs in the art", with Mel Cook on colours and Nic Wilkinson on lettering. Speaking at the British International Comic Show last weekend, Markosia's head honcho Harry Markos told the audience of a panel about British comics that he had some 60-plus books in development at present. The Indifference Engine looks set to be one to look out for. British comics creator Sean Michael Wilson is clearly a happy man - and has every right to be after his new book, Hagakure: The Manga Edition, went on sale in Japanese bookshops this week. Written by Sean, art is by Japanese creator Chie Kutsuwada and the book, which will also be published in the UK and US, is out now in shops like Kinokuniya and Tsutaya, the big highstreet bookshops in Japan. "This is the first original manga that Kodansha's International department has ever done," he told downthetubes. "It's amazing that in its 50 year history it has only ever repackaged existing ones from the wider Kodansha family. "But now Kodansha International have started an original mature manga line, and Hagakure is the first. So it's something of importance." Sean, who first sprang into the comics limelight with his self-published and critically-acclaimed Angel in the Woods back in 2003, describes the story as "a closely authentic adaptation of the classic samurai book from the 17th century." 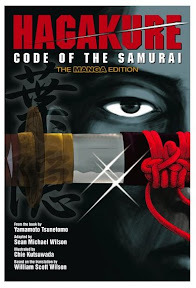 It's a collection of tales and anecdotes by the real-life samurai Yamamoto Tsunetomo, who lived between 1659-1719, and the manga is based on William Scott Wilson's English translation of the original book, which was compiled towards the end of Yamamoto's life. In addition to Hagakure, Sean has been busy in other arenas, scripting an adaptation of the recently-released The Canterville Ghost for British publisher Classical Comics (as well as Wuthering Heights, released in the summer). • Hagakure: The Manga Edition is available in Japan in Kinokuniya, Tsutaya bookstores, etc. Price 1500 yen. • Hagakure is released 1st November 2010 in the UK (and in January in North America) by Kodansha International Ltd - and will have a launch event as part of London's ComICA Festival. (with thanks to Matthew Badham): The magical world of the Moomins from Finland has delighted and captivated children and adults alike for the last 65 years. This week (Saturday 23rd October), a new exhibition opens in Bury Art Gallery that will bring this magical world to the town as the first exhibition of a unique cultural partnership between Bury and Tampere in Finland. It will be the only exhibition in the UK that coincides with the 65th anniversary of the Moomins and opens as all the Moomin stories are reprinted in English and Comet Chase, the latest Moomin movie, launches at the Cannes Film Festival, with a soundtrack by Bjork. The exhibition seeks to capture the magic of The Moominvalley of the Tampere Art Museum, which creates the feeling of visiting the Moomin valley itself. Dimly lit with pools of dappled light with the Moomin boat and islands of stepping-stones, this enchanted space will provide the perfect backdrop for these original Moomin illustrations. Tove Jansson was a prolific illustrator and less well-known for her work produced in newspapers. Depicting the cherished characters of Moominpapa, Moominmama, Moomintroll, Little My, Hemulen and The Groke, her beautiful drawings will be shown alongside a collection of rare examples of Jansson’s illustrations published in Finnish daily newspapers. The exhibits will appeal to children who are fascinated by tales of the Moomins but also to adults who can appreciate Jansson’s expressive drawings and the darker subtexts of the images and stories. Finnish writer and artist Tove Jansson created the white hippopotamus-looking creatures whose adventures were translated into 34 languages. She wrote and illustrated eight books about these eccentric creatures, the first of which, The Moomins and the Great Flood, was published in 1945. "Getting the Moomins to come to Bury is a real coup for the town," said Tony Trehy, Arts and Museums Manager for Bury. "It's a measure of the international profile of Bury's Art Gallery that we were able to agree the partnership with the Finns - an arrangement which we hope will bring future benefits to Tampere and Bury." 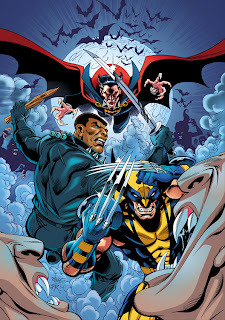 Here's a sneek peek at an upcoming cover for Panini's Marvel Heroes title by fab artist John Royle. John's also penciled the upcoming X-Men and Dracula strip from what he tells us is a great script by Mitchel Scanlon, with inks by David Roach and "lovely colour" by John Charles. "I'm just working on a two-issue Spider-Man story for Panini's Spectacular Spider-Man," he tells downthetubes. "It's a great action adventure featuring Spidey, Dormammu, Doctor Strange, Captain Britain, Spitfire, Union Jack and Megan!" When not drawing Spider-Man or X-Men, John's also been busy this year for a variety of commercial clients. 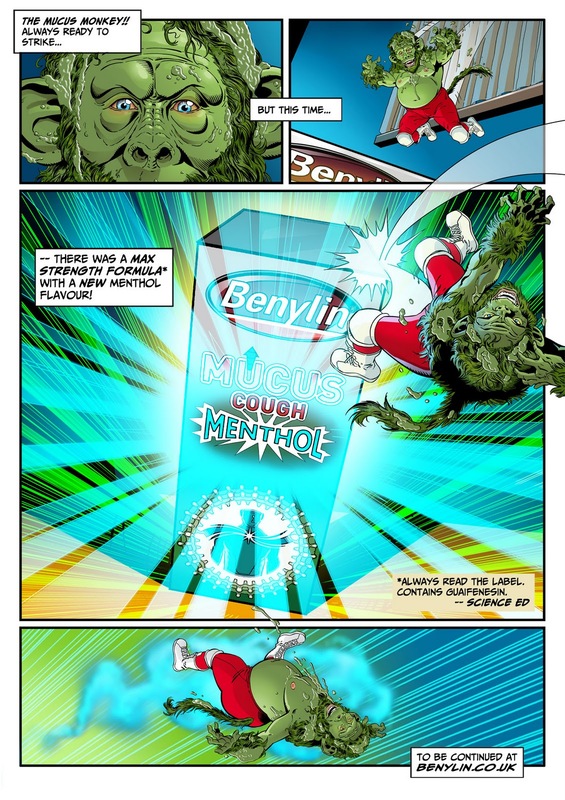 A recent job was a one page comic strip ad for Benylin, commissioned by top ad agency JWT, which is now running in various magazines in the UK such as Closer and marks another appearance of "Chester the Mucous Monkey" seen in the brand's recent TV ads, brought to CGI life for the small screen by Leigh Brett. The page went through several changes at art and lettering stages, but JWT and the client are delighted with the final look, which was deliberately intended to 'homage' classic comic storytelling, right down to the "Editor's note" in the main panel. The London MCM Expo has announced that comics legend Chris Claremont is to be a special guest at the 29-31 October show’s Comic Village. The award-wining comic book writer and novelist is best known for his 16 consecutive years at the helm of Marvel’s Uncanny X-Men, where he penned many classic X-Men stories including ‘The Dark Phoenix Saga’ and ‘Days of Future Past’, but British comic fans will remember him as the creator of Captain Britain, back in 1975. His time on Marvel’s flagship title saw Chris develop many of the X-Men, particularly when it came to shaping strong female characters such as Storm and Phoenix. In addition, Claremont helped launch spin-off titles such as Wolverine; X-Men: Legacy; New Mutants and Excalibur. Claremont joined Marvel back in 1969, writing his debut comic Iron Fist in 1974 and working there until 1991 when he left the company over editorial differences. 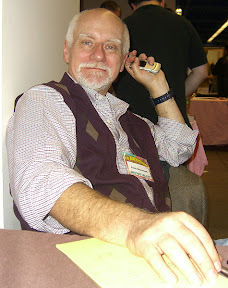 However, 1998 saw Claremont return to the comics giant as editorial director and the regular writer of Fantastic Four. Since then, he has worked on a range of popular titles including New Excalibur, X-Treme X-Men and, to the delight of fans, Uncanny X-Men once again. 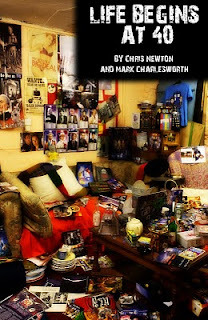 Books about Doctor Who aren't exactly rare these days and downthetubes wouldn't even begin to try to cover all of them. But every so often, a title of particular interest emerges which is worth looking out for. Often these are labours of love from smaller publishers, devoid of official status and the BBC Doctor Who logo. The Pandorica Opens by Frank Collins (contributor to the Doctor Who Appreciation Society's Celestial Toyroom magazine and the man behind the excellent Cathode Ray Tube blog) looks like being a highly informative and interesting look at Matt Smith's first season as the Doctor. This is not a "who directed which scene on which day" kind of book. To quote Frank: "this is not an episode guide. You won't find a minutiae of detail about the production of the series, nor will you find exhaustive cast and crew lists. "It's not a 'making of', it's more of a 'what does that episode really mean' book." • Doctor Who: The Pandorica Opens is available for pre-order from Classic TV Press. Registration for Comics Forum, a two-day academic event taking place as part of this year’s Thought Bubble Sequential Art Festival in Leeds, is now open. 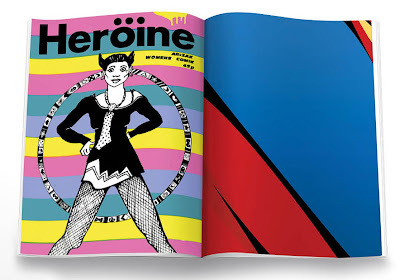 The Forum includes the Women in Comics II conference on 18th November and Theory and Practice: A Conference on Comics on the 19th. Taking place at Leeds Art Gallery, Women in Comics II celebrates the contributions of women in comics, noting the increasing number of female artists, writers, scholars and publishers of comics, with guests that include Suzy Varty, who published the very first all-woman comic book in 1977 in the UK, Heroine in the UK, Maureen Burdock and Karen Hansen. Theory and Practice - A Conference on Comics will investigate the strong ties between production and scholarship of comics, discussing why, for example, creators still work on comics even when they are unprofitable and the work of Grant Morrison. • For more details see visit: www.thoughtbubblefestival.com/ACADEMIC.asp. To register, please email Ian Hague at: I.HagueATchi.ac.uk and let him know how many tickets you would like. • Tickets cost £15; this covers entry on both days and includes lunch. Payment will be taken in cash on the day. You are advised to register as seating in the venue is limited and the organisers cannot guarantee entry to unregistered attendees. With the folding of the British book publisher Reynolds and Hearn earlier this year, the continuation of the series of books reprinting comic strips from the 1960s TV Century 21 comic looked to be in severe doubt. 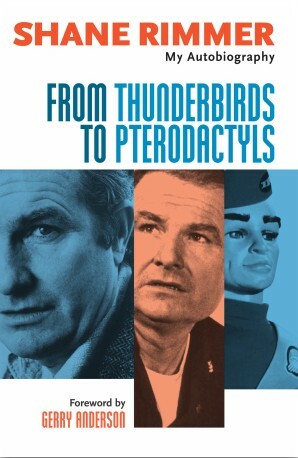 Reynolds and Hearne had published four volumes of the series before the company was put into voluntary liquidation and had two further titles scheduled before the end of 2010 - Volume 5: They Walk Among Us and a Gerry Anderson Century 21 annual for 2011 (which was expected to be similar to the main volumes but reprinting annual strips). Despite Amazon still listing them, these will not now be published - at least not by Reynolds and Hearn. Marcus Hearn has set up his own publishing company named Signum Books and is planning to continue the Century 21 books at Signum. The first Signum book to be published is an autobiography entitled From Thunderbirds To Pterodactyls by actor Shane Rimmer who was the voice of Thunderbird 1 pilot Scott Tracy in the Thunderbirds TV series as well as appearing in many films over the years including The Spy Who Loved Me and Batman Begins. This book will be launched next weekend, 23-24 October 2010, at the Fanderson convention TV21 being held in Bristol. 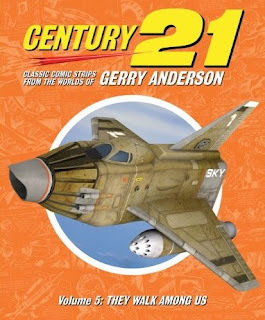 As for the Century 21 volumes, the Signum Books website indicates that the series will be relaunched with the full support of Gerry Anderson by Signum in 2011. The website also includes a history of the comic by author Chris Bentley. There are more details on Signum Books at their website. As Jeremy Briggs notes in his report on Doctor Who Adventures, the BBC have published a new online Sarah Jane Adventures comic. 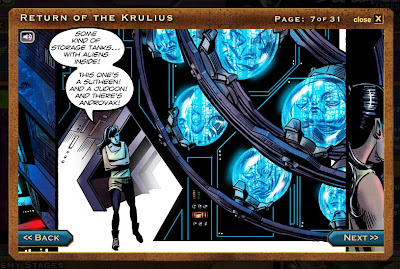 Although published in a web-friendly 'sliding frame' the original art, downthetubes can reveal Return of the Krulius, drawn top science fiction illustrator and 2000AD stalwart Neil Roberts, has actually been drawn in a standard comic page format. 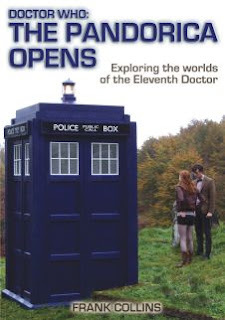 With that in mind, we're wondering if the BBC will eventually consider publishing a print edition of the new adventure. Recently interviewed on a blog I've created promoting my new art book, SciFi Art Now, Neil reveals comics have always been a source of inspiration for him – of all kinds, from Nutty, Oor Wullie, Victor to Starblazer and Eagle. "I was really into artists like Ian Kennedy, Gerry Embleton, Mike Noble, Frank Bellamy – although I didn’t know their names at the time," he says. "I came to 2000AD and American comics quite late, but I instantly loved Dave Gibbons and Colin Wilson’s work. "In addition to that, I remember in one of the 1980’s Eagle annuals there was an article about how computer games were made and that switched a light on in my head. This was quite an exciting moment for me as a young child, as it was around the time Tron came out and my family had just bought a Commodore 64, so the prospect of using computers to make pictures seemed a very real and exciting idea."